The wonderful Pam over at Crossroads of My Mind has nominated me for a Liebster Award. Thank you so much Pam! It's basically a great way for bloggers to get to know eachother. 1. You must post 11 things about yourself. 5. 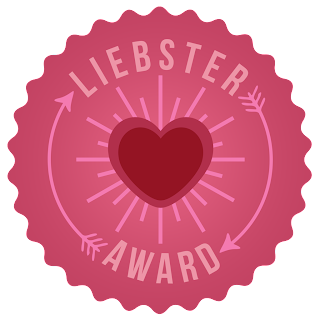 Please leave me a comment on this post with the URL to your Liebster award so I can learn more about YOU! I just finished school last year and am still trying to find work in my field (human resources). I am shy and sometimes have trouble making new friends. My boyfriend is my best friend in the world. I love to read. My Mom likes to tell people that when I was a toddler I used to go to bed with books instead of stuffed animals. I started this blog in 2011, but only really started posting recently. My father was in the military so we moved around the country a lot when I was growing up. I have panic disorder. I was using medication to control it, but came off the medication a few months ago and seem to have it pretty much under control save for a few minor attacks (mostly while I'm sleeping). I love stitching for other people. Most of the projects I do are not for me. I have a hard time finishing what I start so make sure you keep on me if you don't see any progress on a project. I'm really happy to be part of this blogging community. I've read a lot of blogs for a while now, but just starting jumping in and participating. It feels great. Why did you decide to blog about your stitching? While reading stitching blogs I saw that there was a wonderful sense of community. Stitchers from all around the world were talking and sharing. I wanted in on that. Plus it's always nice to show off my stitching to people who can appreciate how much hard work goes into each and every piece. How do you find time to stitch? I do most of my stitching after work. Right now my boyfriend works an afternoon shift so he's gone when I get home and doesn't get back until after I'm asleep. This leaves me in an empty house every evening so I make sure I pick up the needle and floss for at least a couple of hours every day. What cross-stitch designer do you like to collect? Heaven and Earth Designs, Joan Elliot, and Margaret Sherry are three that come to mind immediately. Have you ever been to a stitch-in? No, but I would like to if I ever get the chance. What’s the most you’ve spent on a pattern? If it was just a pattern, probably $20-25. Kits are another story. What’s your favorite stitching tool or gadget? My needle? I don't really have any special tools that I use other than the standard equipment. Patterns and stuff I'm working on are stored in a little wooden cabinet we have. Everything else is in a giant cardboard box in the closet. Lol. I do need to get it more organized, but we don't really have a lot of space or shelving right now so it will just have to wait. My electronic patterns are super organized though. This is something that I don't do that I really should. Does anyone have a favorite stitchy organization or charity that they can recommend? What do you do while stitching (TV, movies, radio, audio books, travel)? I usually watch TV on DVD. I like things I've seen before because I don't have to pay too much attention to them. I also like audio books and old time radio dramas. A great place to find things like that is Archive.org, they have tons of free domain recordings to listen to. Have you ever had a cross-stitch disaster (lost patterns, chewed, stained, or burned stitching)? I don't think I've ever had what you'd call a disaster. Like I've previously stated, my parrot likes to steal my bobbins, but that's really more of an annoyance. The other day I accidently left a needle in the couch and my boyfriend sat on it. Fortunately, he was not really hurt, but he was pretty angry. Have you made new friends (local or online) through your love for stitching? Of course. All the lovely people who are reading my blog right now are my new friends! When and why did you start stitching? Do you do any other crafts or have any other hobbies? What has been your favorite cross stitch project to date? Do you belong to a stitching group or guild? What's your favorite LNS? ONS? How many hours a week to you spend stitching? What's one thing you would love to try, but haven't yet? What does your stitching area look like? What is your favorite book?/Who is your favorite author? What is one thing you truly love about yourself? These are all wonderful blogs and I encourage everyone to go read them. Hi Kat, congratulations on your Liebster Award! It was nice to read all about you. Happy Stitching! thank you so much for nominating me, it was nice to learn more about you, here's my post, hope you enjoy!